Today we’re revisiting our favorite topic of bullet journaling! 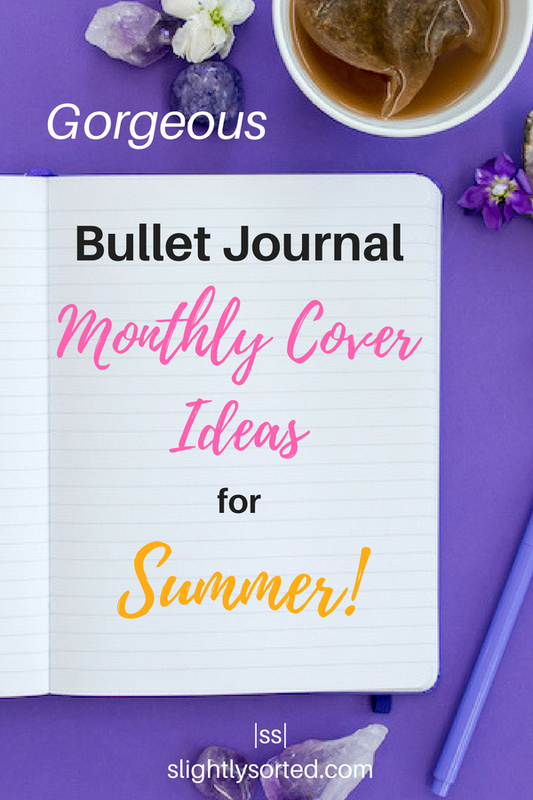 I want to share with you some of the most amazing bullet journal monthly cover ideas for summer to give you lots of inspiration and get your bullet journal looking super-pretty for the sunny season! 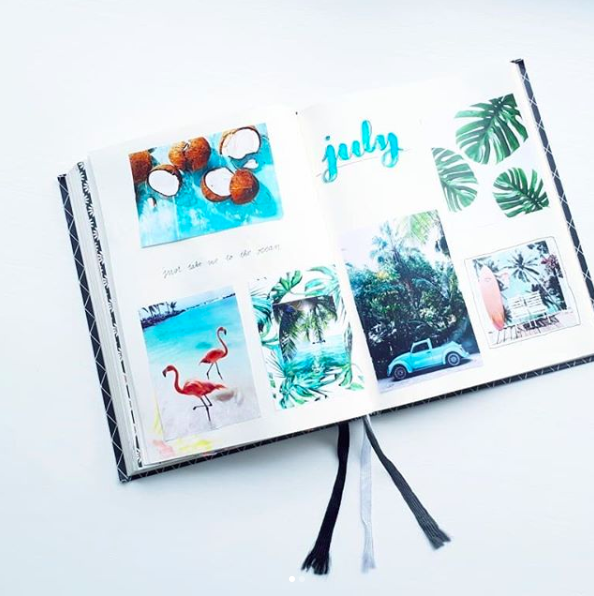 I’ve spent the afternoon trawling Instagram and Pinterest to find some of the most beautiful bullet journal monthly cover ideas to share with you, so you can copy or just use these for inspiration and put your own twist on things. 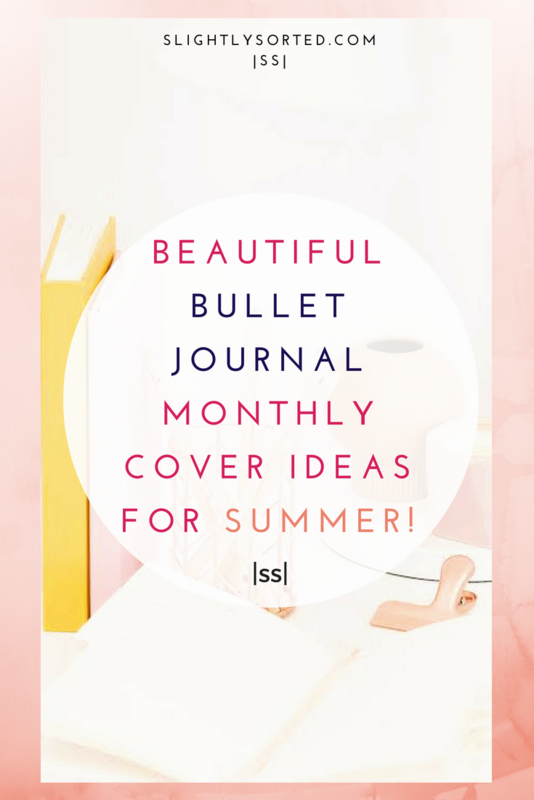 So let’s get to it, with my big round-up of the most gorgeous and inspiring bullet journal monthly cover ideas around!…. 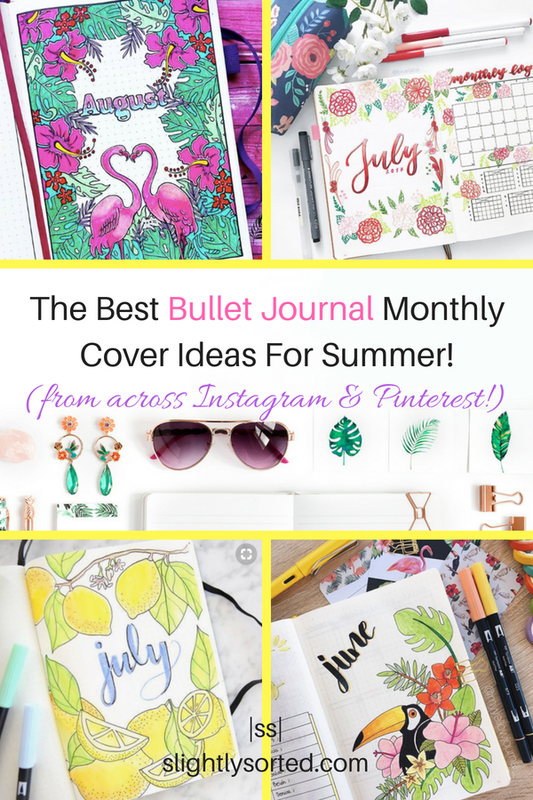 Simply Gorgeous Bullet Journal Monthly Cover Ideas For Summer! 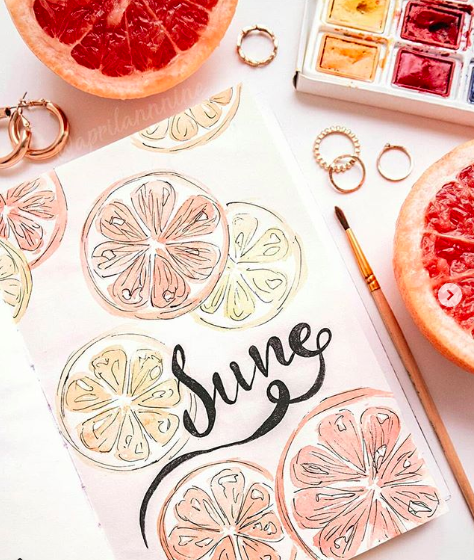 This muted citrus combination is one of my all-time favorite summer color schemes, and I love the way aprilannine on Instagram has incorporated it into her June bullet journal cover page! As you can see, she’s painted this and the effect is beautiful, but if you’re after something quicker then give it a go with your mildliners. 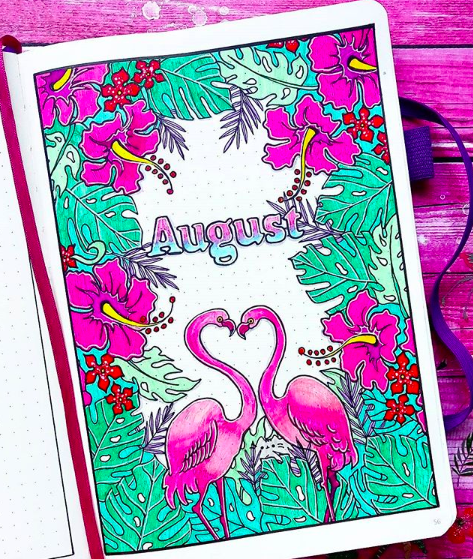 I’m loving this super-bright flirty flamingo August cover by kobieta_z_pasja on Instagram! It looks like she’s used a combination of ink and pencil to create this gorgeous little work of art – if you want to try something similar I recommend Prismacolor pencils and the matching blender to get a soft look like on the top of the bird’s wings here. 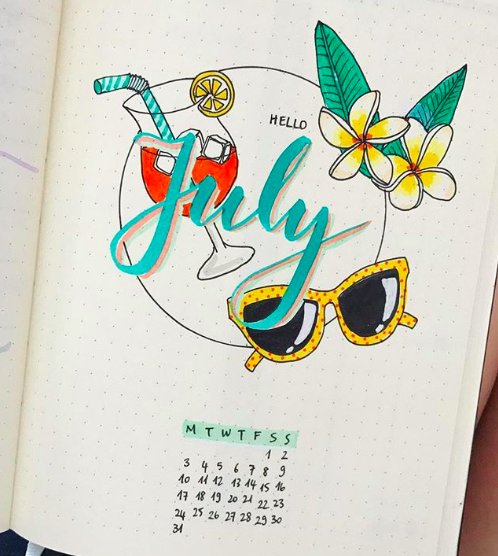 This July bullet journal cover by bluelahe on Instagram would definitely cheer me up on any not-so-sunny summer days! 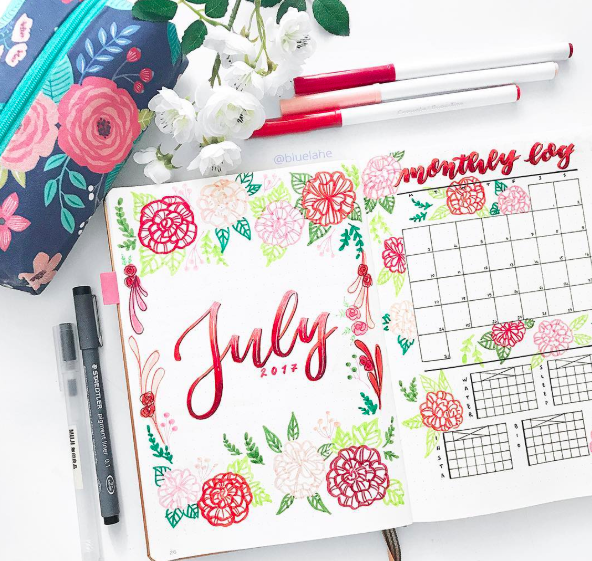 I love the bright colors – especially the red, which for some reason you don’t seem to see that much of in bullet journals (or is that just me?!). More summer birds! I can’t resist trying out my own version of this cute toucan by myyellowjournal on Instagram. The clean lines mean that it should be relatively straightforward to recreate using your Tombows. If florals (or birds!) aren’t your thing, then how about this gorgeously fresh citrusy lemon cover page by Erica at Miss Louie? Once again, get out those trusty Tombows! 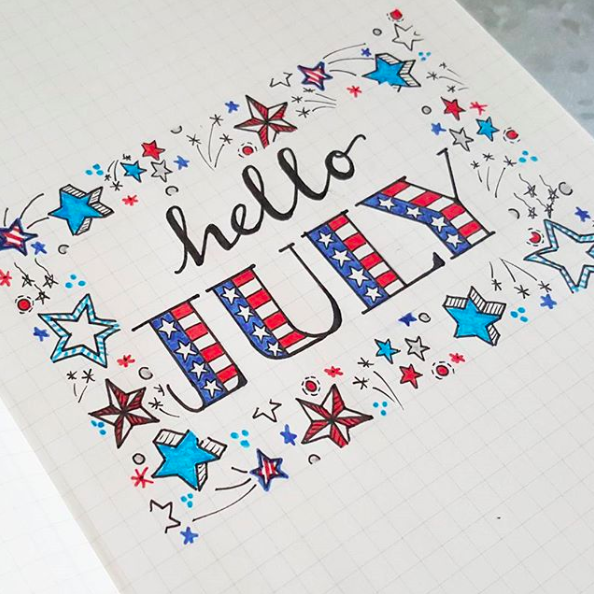 Or maybe you’d prefer to dedicate your July bullet journal cover to celebrating 4th July! 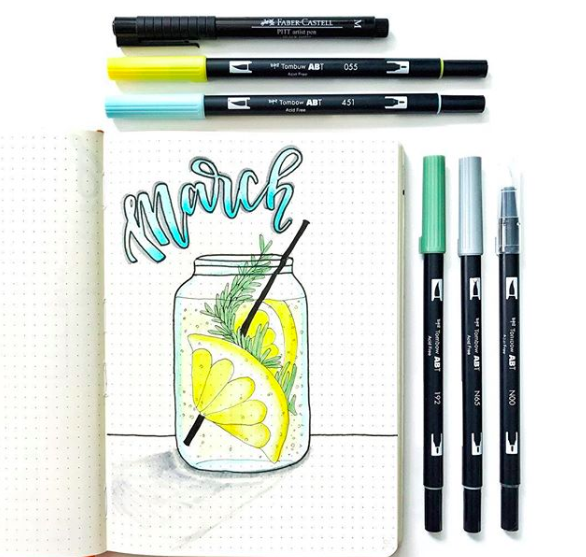 I love this simple bright design by oak.tree.journaling on Instagram. 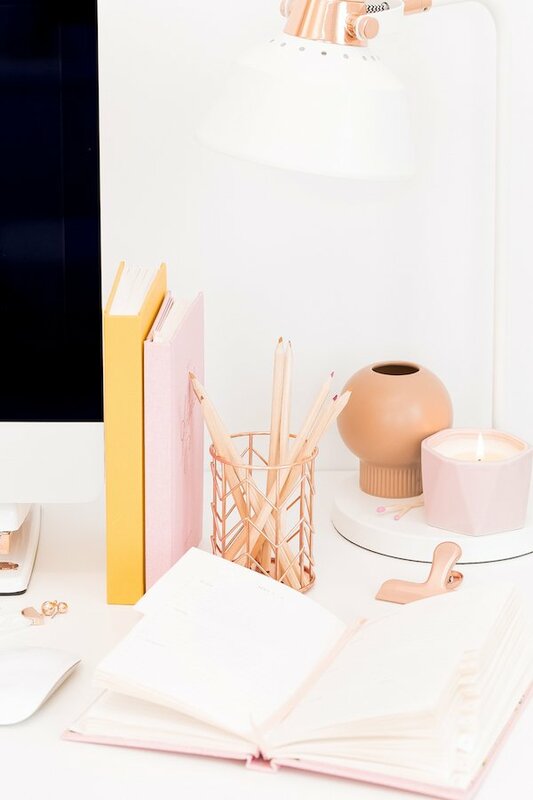 If you don’t feel like getting arty, why not just source some of your favorite summer images for your cover pages, like study.nl on Instagram? I love the way the color theme is consistent (love that bright aqua) and the stylish images make me feel instantly summery! 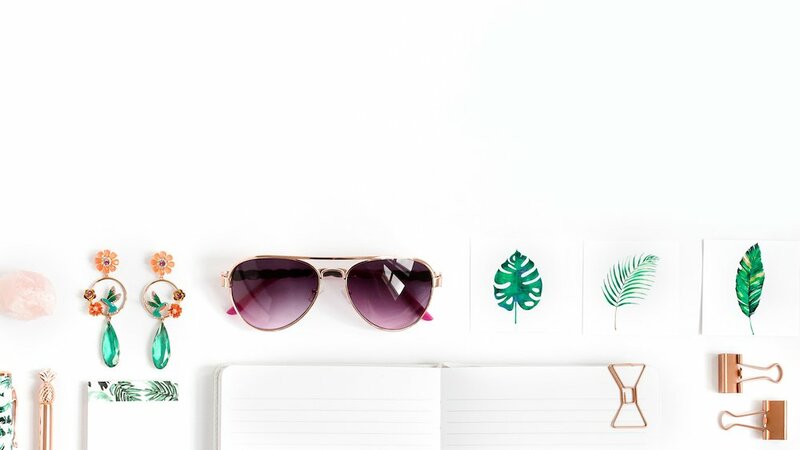 Or you can create your own bright summer style images like bujokitty on Instagram! The spaces she’s left on the sunglasses lenses do a great job of creating the illusion of a reflection. 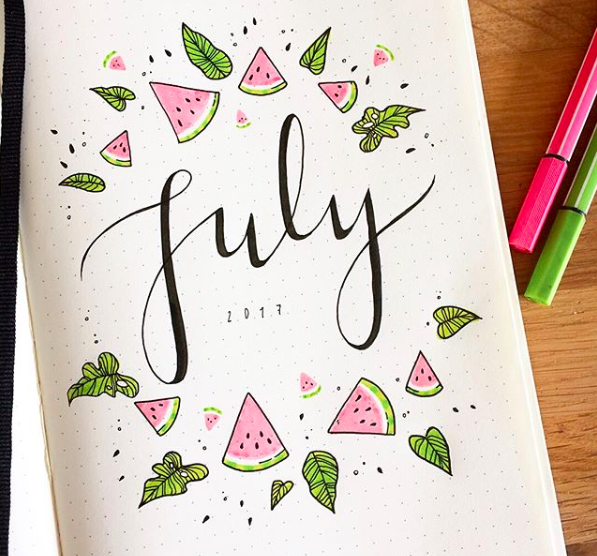 If you fancy including a bit of pink in your summer bullet journal pages, how about some juicy watermelon slices, like these ones from eliesindigneart on Instagram? 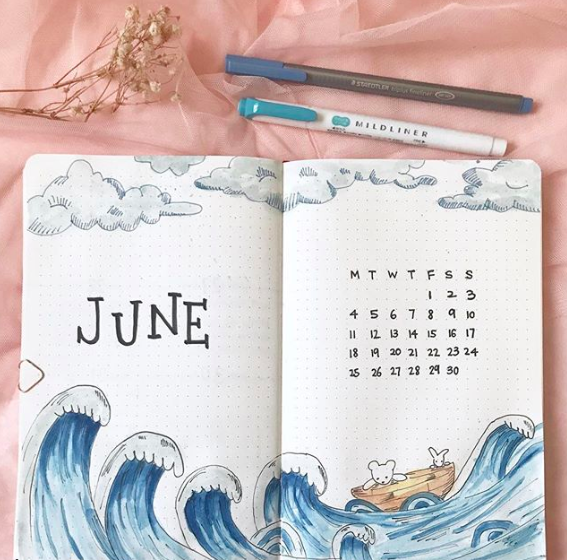 If you’re after something nautical for your bullet journal monthly cover ideas, look no further than this little work of art by bujowithnato on Instagram! You can see that she’s used her blue mildliner, and I’d suggest the Prismacolor pencils and blender would work well for something like this too. And finally let’s finish up with this lovely lemonade theme by skulleyart on Instagram, using yellow and aqua Tombows. Yes, I know that March isn’t technically summer, but lemonade is definitely summery and it’s too lovely to leave out! 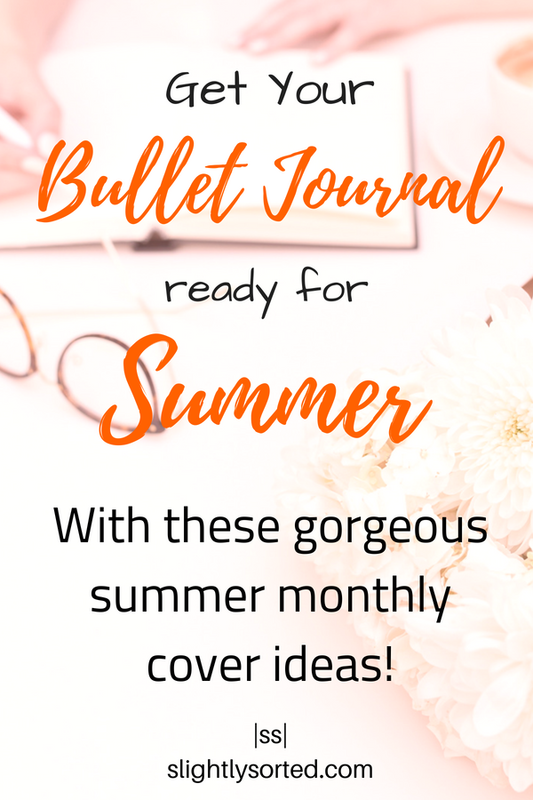 And that just about does it for the most beautiful bullet journal monthly cover ideas for summer that I’ve found! Which is your favorite? 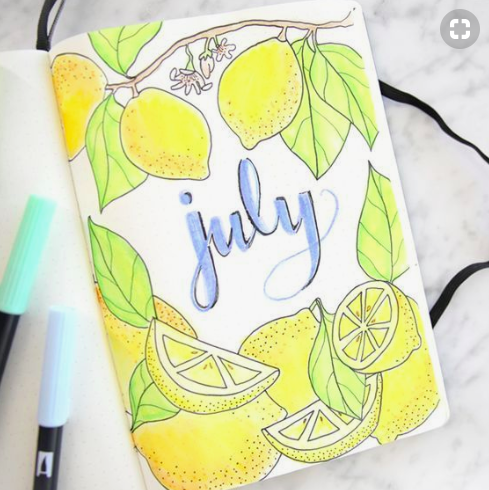 I’d love to know, and whether you’ve found any gorgeous bullet journal monthly cover ideas that I’ve missed! 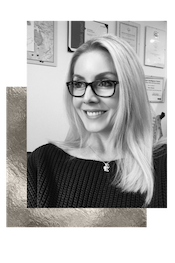 I always love to hear from you, so please let me know! 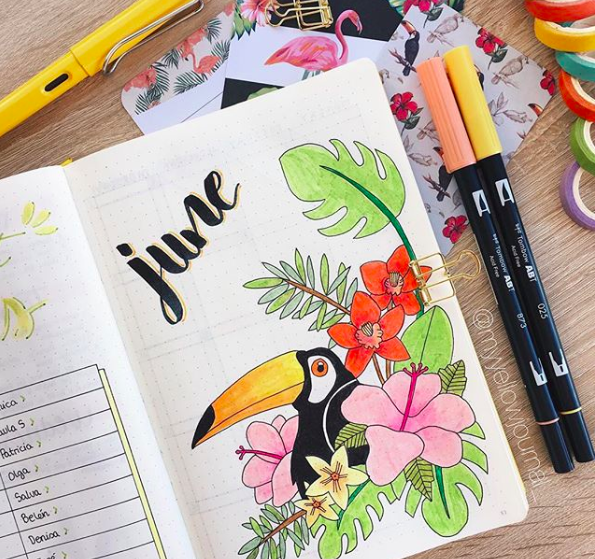 Need to top up your bullet journal supplies to create some gorgeous cover pages? Check this out. 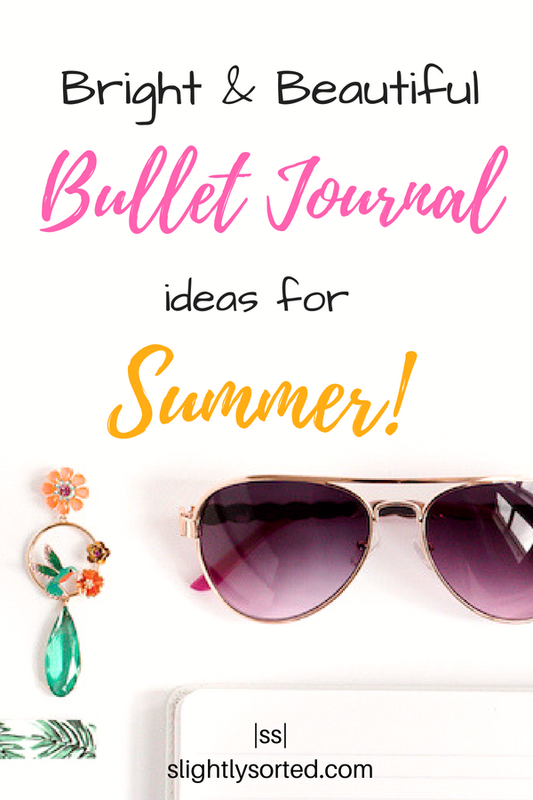 Enjoyed these bullet journal monthly cover ideas for summer? 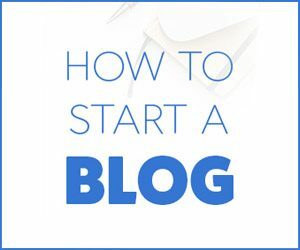 Why not save them for later on Pinterest!